He doesn’t need no “stinking Social Security”! The median Social Security benefit in the United States is $1,335 a month, before they take out monthly $100+ in Medicare premiums. Jeb Bush, the somewhat fat and very goofy brother of former President George Bush, wants to steal that benefit, not for one month, but for 36 months, or a total of $48,060. What will you get in return – probably just a chance to say you contributed to lower taxes for rich families like the Bushes. Jeb thinks this plan will win him the Presidency, which is why it was announced today with a peculiar thought process that surrounds most petulant aristocrats. Jeb knows the very rich just don’t need Social Security. Most make more in a day than you will earn in benefits in a year. The math of these cuts is revealing. About 99% of the folks who currently live to 67 receive Social Security. Estimates are that 10,000 persons a day retire, so this Bush cut in benefits of $48000 will equal about $175.2 billion a year out of the pockets of working Americans. Good news for the rich is that it could mean a billion dollar annual tax cut for the richest 175 families, including the Bushes and their swarm. If you were planning to retire at 62 – forget it. Jeb wants today’s 62 to become tomorrow’s 65. Everyone who planned to rest their tired bones will have to work an extra three years, probably just for those top enders to get more tax cuts. And, jf you dreamed you at least would get Medicare (with all its imperfections) at 65, think again. Jeb wants you to buy a private plan with some amount set by the same politicians who are stealing that $48,000, When premiums go up and you can’t pay for health insurance, your death will also save money in future benefits, allowing even more tax savings for those “entitled” families at the top. For Medicare, Bush praised the structure proposed by Rep. Paul Ryan that would move toward privatization. He said he would allow seniors to keep their Health Savings Accounts, and he would push for new plan options. Chris Christie, Jeb’s flatulent foe, was quick to struggle up on the bandwagon, exclaiming that his cuts were even bigger than the former Presidents’ son and brother. A member of the extended former financier Pete Peterson family, Maya My Guiness, thought this was all great, and if she had time (or knowledge), she would explain how happy the banks will be when those billions of dollars are not held by the government, encouraging more to pay fees for private accounts. To put all this into perspective, imagine how much money you would require to get that stolen $16,000 a year. At 2% interest you would need $800,000 in the bank. That’s the real cost, and the real amount this Jeb plan will cost you. 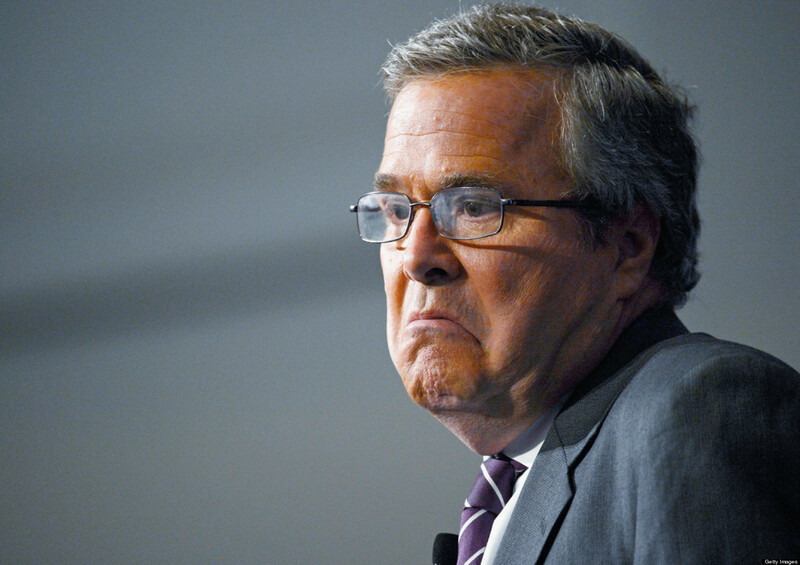 Jeb wants you to start saving now, and I’m sure he knows some bankers to recommend. For those of you who miss the full scope of Jeb’s foray into finance, he also said you will not have to pay the 6.2% FICA tax when you work past 70. He forgot to add – if you live that long. What a plan…take from working stiffs and let them work even longer…meanwhile hedge fund managers and rich coupon clippers can live longer on our dime. What about the contract we were told we signed up for when we got our first paycheck?